Globally manufacturers spend more than $70 billion to cover warranty expenses each year, but that is only the beginning of the true costs associated with poor product quality and suspect warranty claims. Increased government scrutiny, tarnished brand image, reduced stock prices, dissatisfied customers and lost sales can quickly dwarf the direct monetary losses. To reduce claim costs and increase customer satisfaction, forward-thinking manufacturers are applying automated analytics across the warranty chain. 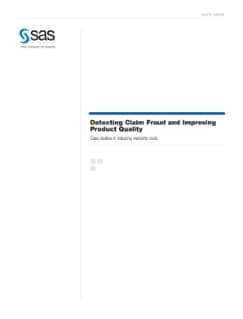 Detecting and preventing fraud, finding emerging quality problems sooner and accelerating the problem-solving process can reduce warranty costs by more than 20 percent while keeping customers happy. This paper shows how some companies are applying analytics at multiple points across the warranty timeline and the results they have achieved in both issue and fraud detection.